Street Views: 28 and 11 Suppl. 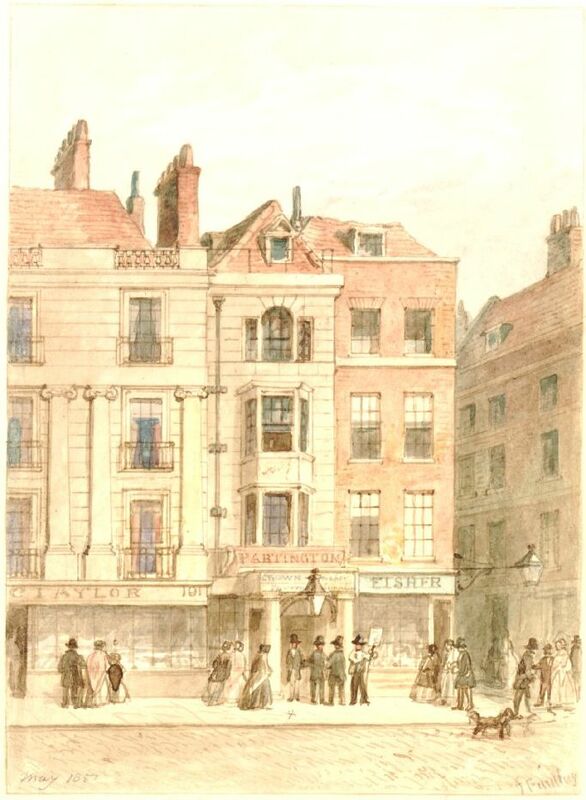 On the corner of Arundel Street and the Strand, the premises of Samuel Fisher could be found. Arundel Street was built in 1678 on part of the site of the demolished Arundel House. The picture below shows the shop as it was in 1851, next door to the entrance to the Crown and Anchor Tavern. Samuel Fisher was a young man from the parish of Saint John, Hampstead, but that is all I know about his background. He first appears in the records in 1837 when he marries Mary Smith of St. Clement Eastcheap on 23 February. Mary was still a minor and the marriage registration duly noted that the marriage took place “with consent of the legally appointed guardians of the said Mary Smith”. No address was given for the couple, but they must have set up the business at 188 Strand quite soon afterwards, as an advertisement in The Graphic mentions the establishment of the firm in 1838. This corresponds with what we know of the previous occupant, Francis Szarka, who left in 1838 after the expiration of the lease. The 1841 census shows the couple at 188 Strand with daughter Mary Elizabeth and sons Robert Edward and Henry. More children were to follow and at the time of the 1851 census, there were five more. The eldest are all given as born in London, but two of the younger ones were born in Beckenham, Kent and the youngest at Willesden where the family resided in 1851. Father Samuel is styled as dressing case maker, but in various directories and advertisements he is also called needle maker or cutler. 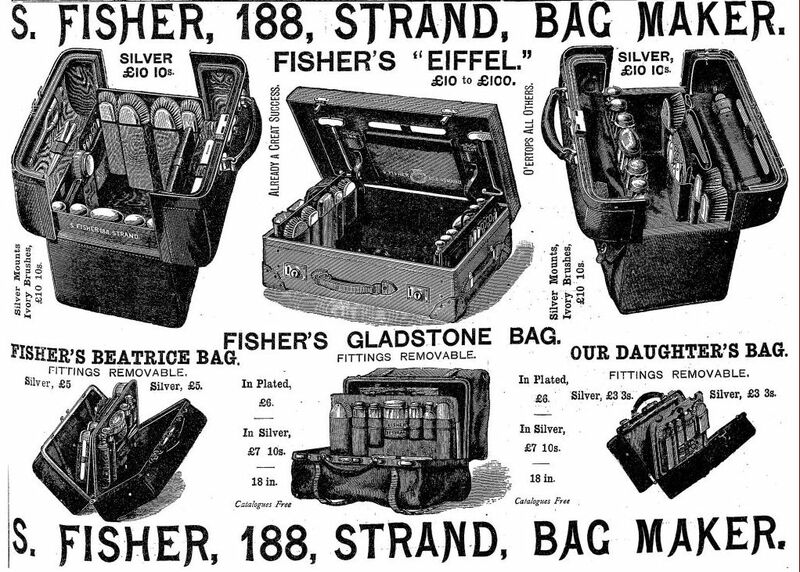 The Fisher firm sold all kinds of items, not just dressing cases and needles, but also billiard tables, stoves, trunks, travelling bags, scissors, Nuremberg caskets, lamps, and flasks. 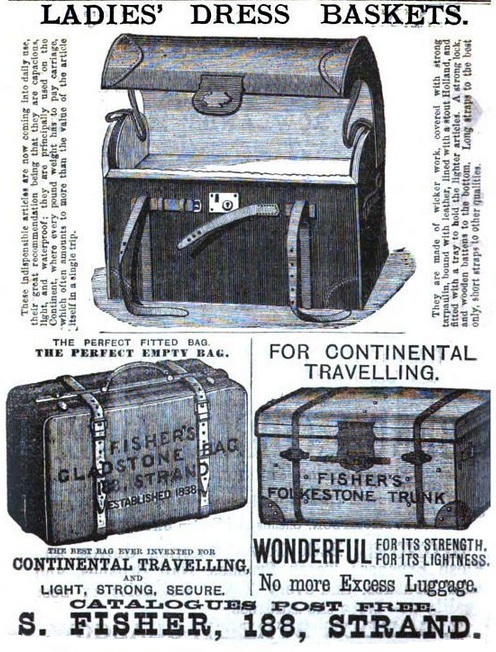 The article they seem to have been most proud of, as it appeared in numerous advertisements, was their Gladstone bag which was “perfect as a dressing bag” and “perfect as a travelling bag”. The address for the extensive Fisher family (in the end there were at least 14 children) in 1851 and 1861 is Willesden, but in 1871 and 1881 Ravenscroft Lodge, Penge. Samuel dies on 9 March 1890 at 10 Anerley Park, Surrey. His probate is granted to his sons Robert Edward and Charles Alfred. 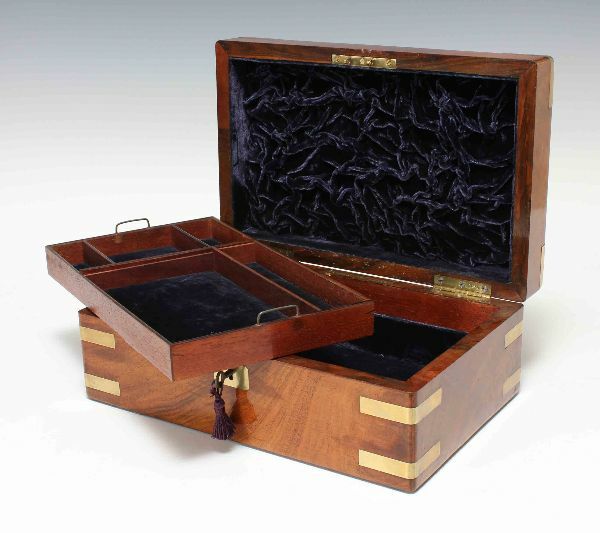 (1) Robert is called a dressing case manufacturer and Charles is a commercial clerk, presumably at the family business as both are given the address of 188 Strand. I am a picture-frame and window-blind maker, and live at Mr. Fisher’s, 118 [mistake for 188], Strand, with my wife and family—we occupy the basement, and my wife acts as housekeeper—Mr. Fisher does not live on the premises—Mr. Stennett, Mr. Fishers foreman, his wife and family, occupy the fourth floor—the first floor is used by Mr. Fisher as a show-room, and the second and third floors are let as offices to Mr. Cooper, an engineer—the access to those floors is by a private door in Arundel Street—inside the shop there is a staircase, leading up through the show-room to Mr. Stennett’s apartments on the fourth floor—there is no door out of the show-room on to the staircase leading up to the second and third floors—the entrance in Arundel Street communicates with the shop as well as the private part of the house, but has no communication with the show-room. While the Fisher family resided in Willesden and Penge, the shop was minded by shopman, later foreman, Thomas Stennett and his family. Thomas Stennett proved a loyal employee and can be found at 188 Strand in the 1851 to 1881 censuses. He is missing from the 1891 census and dies in 1895. His address is then given as Stoke Newington. (3) John Neate has not made it into the census records for the shop. In 1871 the housekeeper is one Martha B. Houghton, and in 1881, the nearest census to the attempted burglary, the Topliffs can be found on the premises besides the Stennetts with Charles Topliff as caretaker and his wife Elizabeth as housekeeper. 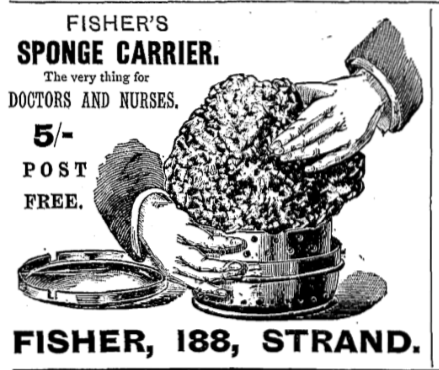 Nothing else of any importance seems to have happened to the Fishers or the shop, so I will stop the story here and leave you with some advertisements. (1) England & Wales, National Probate Calendar (Index of Wills and Administrations), 1890. Estate valued at just over £3107. (2) Old Bailey case t18801123-51. You can read the whole trial here. (3) England & Wales, National Probate Calendar (Index of Wills and Administrations), 1895. Probate is granted to his son George, a salesman. Estate valued at just over £1574.